I created this sign with a one year old ring bearer in mind. I knew it would be helpful if I could make his role in the wedding as easy as possible; after all he needed to concentrate on the new art of walking that he had recently learned! Knowing that the bride was looking for a rustic sign to blend with the theme of the wedding, I found a scrap piece of wood in the garage and cut it down to a manageable size for a one year old (well actually, I let my husband help with that part). I also made the sign "hands free" by creating a twine hanger that would allow him to wear it around his neck while he walked. The bride knew that she wanted "Here Comes the Bride" on the sign, I suggested we add another look to the reverse side. I could create an "established" sign for them with their surname. 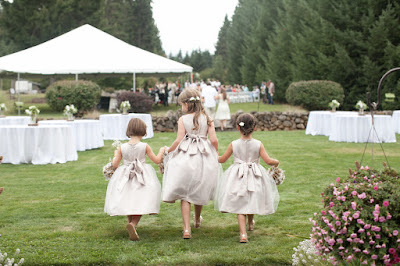 I suggested the sign could be flipped around on the ring bearer (for the recessional), then after the ceremony. 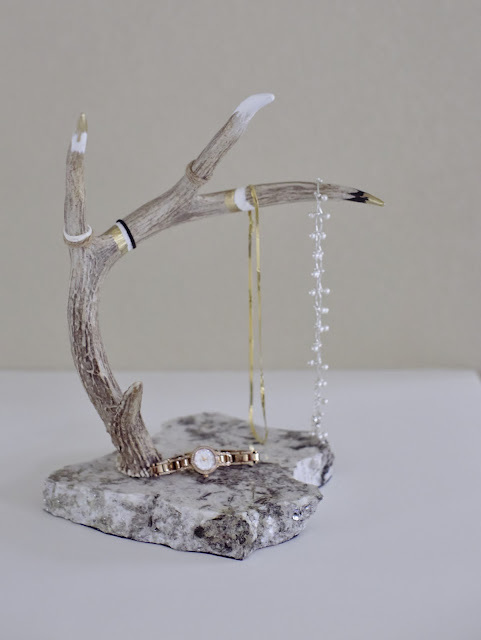 it could be used at the reception (on the gift table, the head table or the guest book table) and finally after the wedding, they could use it for decoration in their new home. So instead of using it only once, they could enjoy it for years to come! I painted a white base coat on both sides of the sign, then added a top coat of a blue grey over that. To give it a distressed look, I sanded to remove some of the paint. The lettering was done on my silhouette machine using black and grey vinyl. Once the lettering was in place, I gave it a good coat of Mod Podge to seal and protect the surface. For the edges, I used a narrow jute twine; wrapping it around three times. I had hoped to be able to share pictures of the little ring bearer with his sign, but it didn't work out quite as planned. Instead he was carried some of the way by his Momma, and when he decided to walk, he was holding the sign by the string and being so low to the ground it was tough to read the sign. Oh well.....it was placed on the gift table after the ceremony and looked great among the gifts. 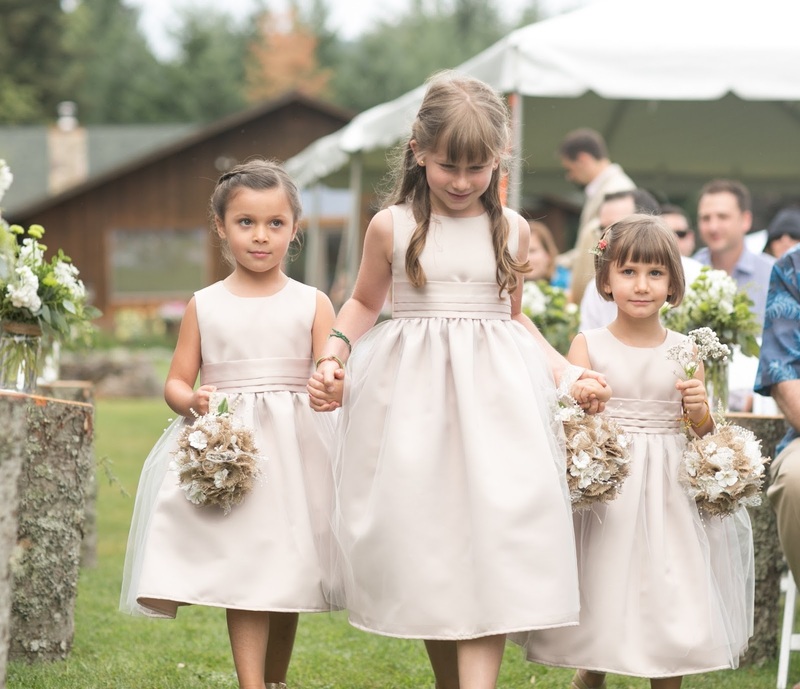 My daughter-in-law has four adorable nieces, three of which would be flower girls for the wedding, the fourth was an honorary flower girl since she was just nine months old. All of the girls live in states other than Colorado, so to begin, I asked for some basic measurements from their Moms. With a chest, waist and length measurement I could get started in the spring, then after a double check on the length about a month before the wedding (to allow them time to sprout over the summer), I could hem them. 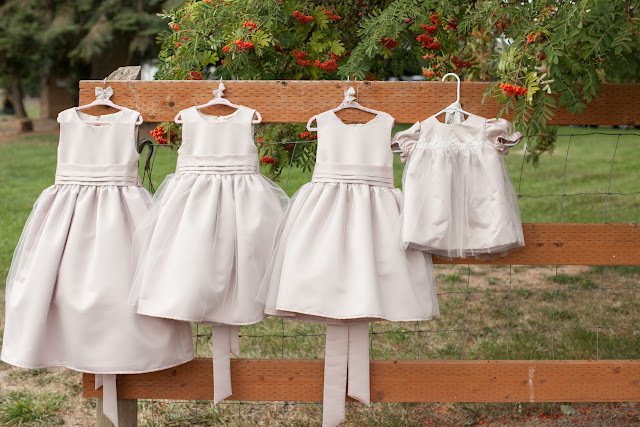 The dusty pink color was so sweet and complimented the bridesmaid dresses so nicely, and with the kissing balls I made of burlap and lace, they looked absolutely adorable. 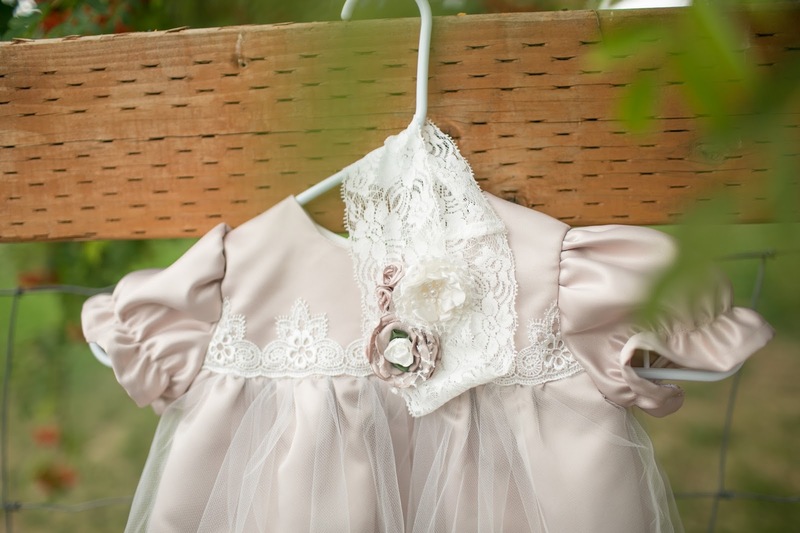 I made the 9 month old a matching lace headband to compliment her dress. 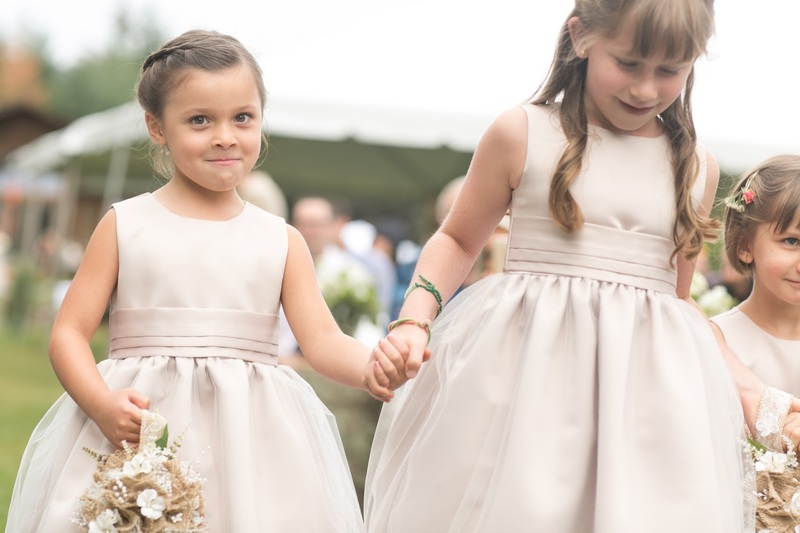 To create added fullness, each of the flower girl dresses has a full crinoline petticoat underneath the dress. I also made personalized hangers for each of the girls. Love it! It's going to be fun for these girls to look back on the pictures from their Auntie's wedding as they get older and see how sweet they looked, and what an awesome job they did on that special day! Wedding gowns are my passion, I love the design process and the opportunity of creating a couture gown for a bride. It's also fun looking back afterwards on the creative process and all the steps in between-from bolt to the finished gown. I've been so anxious to share this, but of course wanted to wait until after the big day. Now, after months of secrecy, I can now give you a behind-the-scenes look at a Shea Marie Designs original. Obviously, when the bride lives in another state as in this case, it can add some challenges, but nothing that can't be overcome. I've created two other "long distance" gowns; one for a sister-in-law and another for my niece and both worked out well. 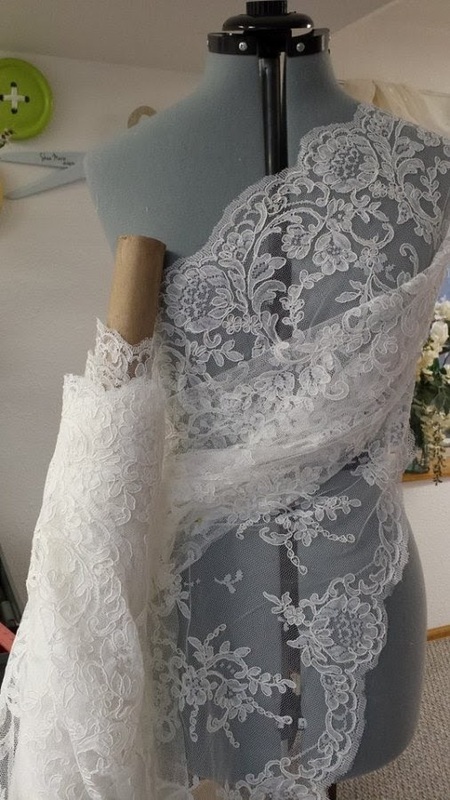 I will say I'm particularly proud of this one since I only had the opportunity for the initial muslin fitting; that's really unheard of....but, as you can see, it fit like a glove! I had Sarah take a plethora of measurements for me, so that when she came to Denver in January, I could have a muslin prepared for fitting purposes. 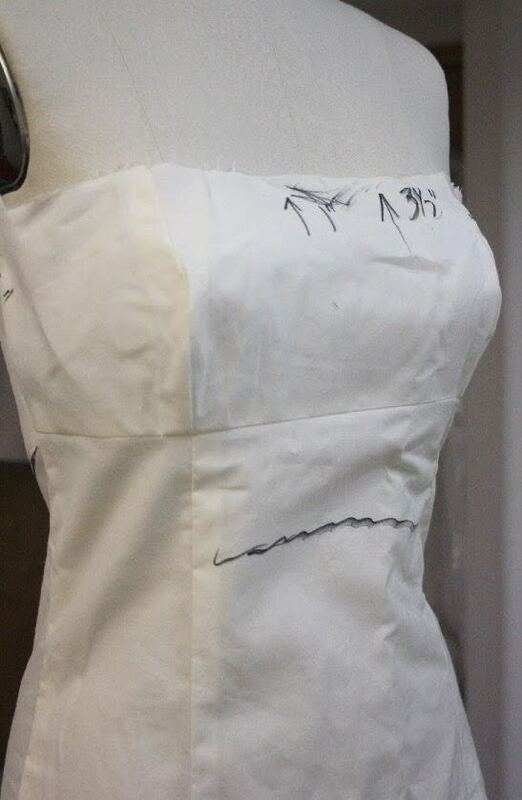 She had been looking at strapless gowns, so I made a simple strapless muslin to ensure my pattern was correct. I found a couple modifications that needed to be made during the initial fitting, but nothing too significant; raise the bodice and take it in a smidge at the waist and hip for a really good fit and flare silhouette. During that initial visit, we also went fabric shopping. 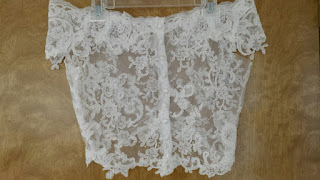 Sarah picked out some beautiful lace and the most luscious and unique latte' colored satin for the underlayer. I constructed the satin underlayer first, and then began "piecing" the lace to create the final silhouette and train; I also had to applique' pieces of the lace motif pattern onto the bodice to create the pattern I was looking for throughout the bodice and waistline since I really wanted to accentuate Sarah's narrow waistline and hips. Sarah also chose to have a shrug that she could wear during the ceremony and then remove for the reception. 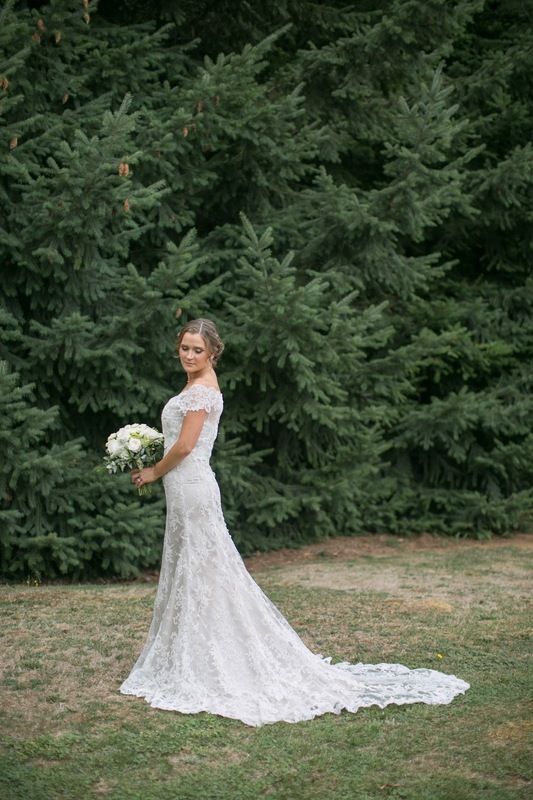 This added design element really set her gown apart from so many others and was ultra flattering for her. 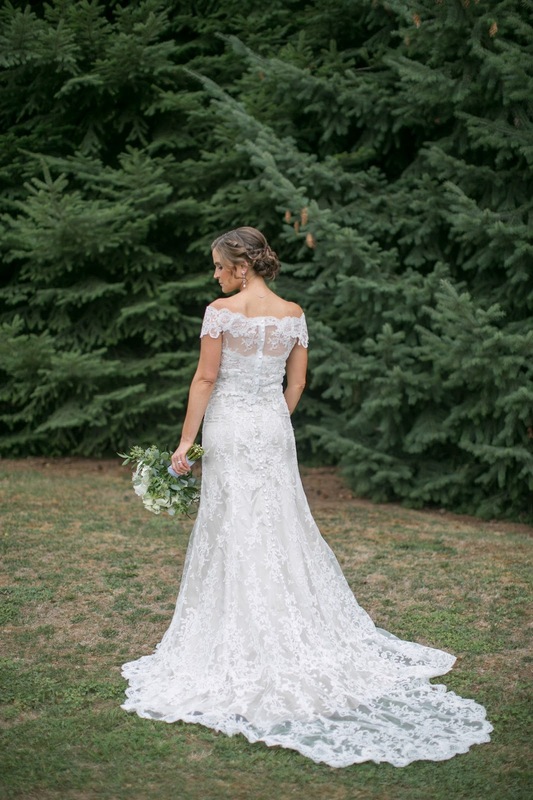 Sarah stands a good 5'9" tall in her bare feet, so she looked so statuesque in this design; it highlighted her square shoulders and narrow torso. She looked absolutely stunning! The gown has covered buttons all the way down the back of the bodice to the very end of the train; a total of 73 to be exact. Another nine buttons are on the back of the shrug. The lace train extended beyond the edge of the underlayer by about a foot; It is also shaped somewhat like a three leaf clover. 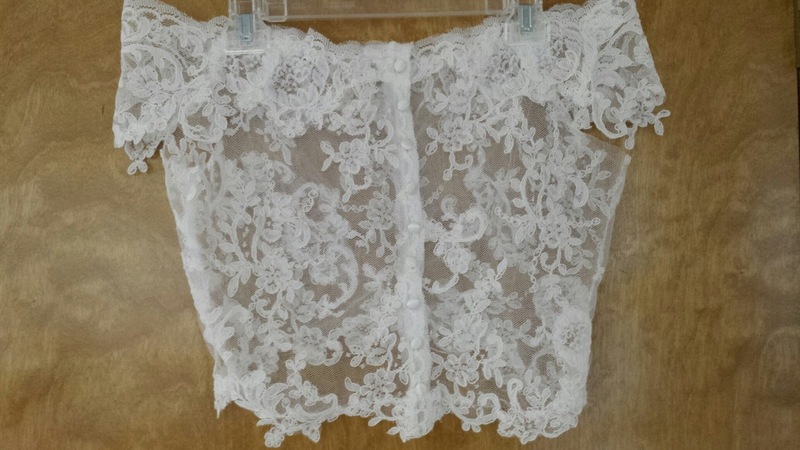 This particular gown was very labor intensive as a result of piecing the lace overlayer. As corny as it sounds, it truly was a "labor of love". In case you're wondering, I spent a total of 65 hours from start to finish. 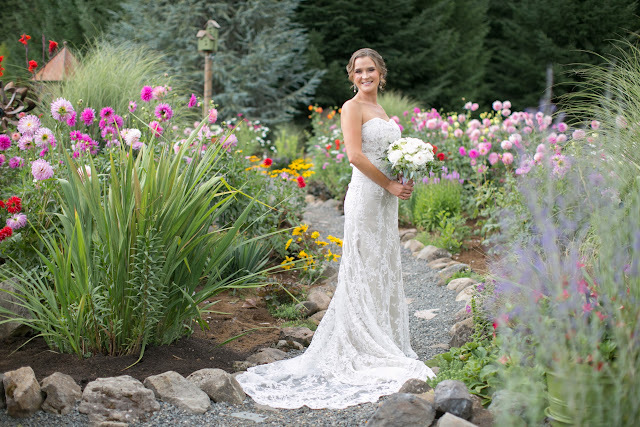 I am so honored that Sarah asked me to create her gown. It touched my heart to see her wearing it on her wedding day. She was absolutely glowing! Congrats Sarah and Clint...Best Wishes on a long and happy marriage. Thank you KB Digital Designs for the beautiful photos.